Under-23 world road race champion Arnaud Démare (FDJ-Big Mat) took his first ever professional victory in the final stage of the Tour of Qatar on Friday, as Mark Cavendish (Sky) fell heavily in the race for the line. Cavendish tangled innocuously with Roger Kluge (1T4i) within the final 200 metres and, despite his best attempts to stay upright, hit the ground hard. Up front, Demare took advantage of an unorganised peloton to win, while Tom Boonen secured the overall victory in the race for the fourth time. The Tour of Qatar ended at full tilt. Though the 120-kilometre final stage, which takes the bunch for circuits of central Doha, is based loosely on the Tour equivalent in Paris, this was anything but processional. Crashes were the order of the final day in Qatar: race leader Tom Boonen had a minor off in the opening hundred metres, while Cavendish was left dazed by his late tumble. Even the van transporting race press got in on the action, driving into a car on the way to the start at the Sealine Beach Resort. The tailwind and fight for bonus seconds saw virtually half the stage’s distance covered in the first hour. The day’s escape returned on the circuits of Doha, leading to another hectic bunch sprint. As Cavendish launched his sprint next to Roger Kluge, the pair appeared to go for the same gap. 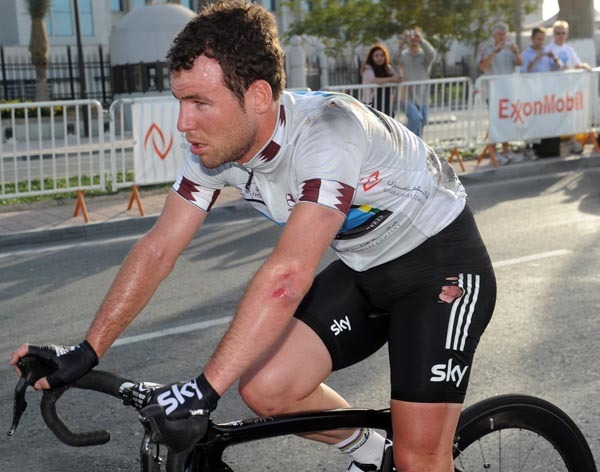 Cavendish bounced off the German, but hit the deck after touching the back wheel of Tyler Farrar, in front. The Briton sustained cuts and abrasions; afterwards, Kluge played down the incident. In front, French first-year pro Arnaud Demare carved a path ahead of the chaos for his maiden professional win. Meanwhile, Tom Boonen (Omega Pharma-Quick Step) stayed out of trouble to win his fourth Tour of Qatar title. There’s a simple reason for why the sprints in Qatar are so unhinged. Feverish on the eve of the race, Cavendish’s week may have started and finished with him on the sickbed. But his two stage victories and strong riding mean it can still be called a good start to the year. On to the Tour of Oman, which starts on Tuesday, for the world champion. “He’s still the fastest sprinter in the world by far – if he doesn’t fall off,” Hunt added wryly.